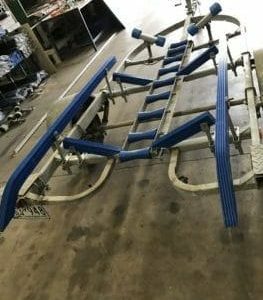 Boat roller ladder racks. 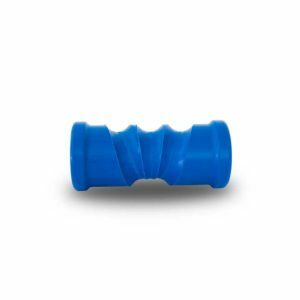 Ideal support for any boat trailer and boat user looking to add extra support to their boats keel. Up to 70% of your boats weight can rest on the keel so it is important to have the correct setup to make sure your trailer can fully support your boat. These Boat Trailer Keel Racks are 2.1 meters long & contain 7x 8 inch keel rollers manufactured out of black rubber material. 2.1 Meters Long Galvanized Keel Rack. 7x 8″ Keel Rollers. Black Rubber Keel Rollers. 7x Spindles To Suit + Split Pins. Note: Due to different types of trailer setups and distances between cross sections. These keel racks do not include mounting brackets / hardware. This will be required by the purchaser so that the keel racks can suit the individuals trailer. For any questions on this, please contact us.Images for display purposes only.